London, UK, 16 May 2016 – Amber Rudd MP, The UK Secretary of State for Energy and Climate Change, has visited EDMI Europe’s Research and Development facility in Reading. 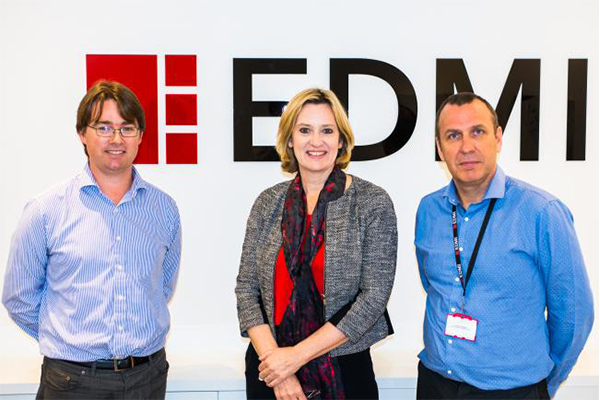 EDMI, a global smart meter solution provider welcomed Amber Rudd and other members of the Department of Energy and Climate Change for a tour of the premises which were opened in 2013. As part of the visit, the group were shown the state-of-the-art testing facilities and introduced to team members who are integral to the development of the Communications Hub and smart meters. EDMI has expanded rapidly over the past few years to support market requirements and will be investing further in the UK and Europe over the coming months.